The Guide to Vessel Operating and Zoning Rules (VOZR) details the general and local rules in place for Victorian waterways. Our waterway maps page has interactive and printable maps of the operating rules of Victoria's waterways. Please note that these are intended as general information only, and should not be relied on for navigation, nor considered a substitute for the VOZR. Any queries regarding the rules should be directed to MSV or the relevant waterway manager. Boaters can enjoy a wide range of waterways in Victoria, including large and small coastal embayments, coastal waters, lakes and water storages, and rivers. Always check the operating rules of a particular waterway before you head out. There are general State Rules that apply for all waters in the State and local Scheduled operating and zoning rules for specific waterways. These rules are approved by Maritime Safety Victoria under Part 5.1 of the Marine Safety Act 2010 (Vic) and preceding legislation. The rules are designed to provide a safe operating environment, to cater for the wide range of boating and water activities, to separate different activities where needed on the basis of safety, and to reflect local conditions. This document is a reproduction of official Notices made under the Marine Safety Act 2010 (Vic) or preceding Marine Act 1988 (Vic) for Notices prior to 1 July 2010. Readers should be aware that the rules are subject to change. References in the State Rules section to the Marine Act 1988 or Marine Regulations 2009 should be references to the Marine Safety Act 2010 or the Marine Safety Regulations 2012. (b) for launching or retrieving a vessel at a boat ramp when the ramp is located in the area specified as an access lane. 'Coastal waters' has the same meaning as in the Marine Regulations 2009. (b) approved in writing by the Director, Transport Safety as competition or training. 'Dive flag' means the Code Flag "A" shown in Chapter 11 and Appendix 2 of the International Code of Signals. 'Enclosed waters' has the same meaning as in the Marine Regulations 2009. 'Hire and drive Vessel' has the same meaning as in the Marine Act 1988. 'Houseboat' means any boat, vessel or pontoon having a fixed house above the deck with accommodation which may be used by persons residing on board for an overnight period or longer. 'Inland waters' has the same meaning as in the Marine Regulations 2009. 'Local port manager' has the same meaning as in the Marine Act 1988. 'No wash zone' means an area of water specified in a Schedule through which a vessel must only pass at a speed which creates minimal wash or no wash.
(d) is designed to be operated by a person standing, sitting astride or kneeling on the vessel but not seated within the vessel. 'Port management body' has the same meaning as in the Marine Act 1988. 'Recreational vessel' has the same meaning as in the Marine Act 1988. 'Rescue' means an operation to retrieve persons in distress, provide for their initial medical or other needs and deliver them to a place of safety and includes any on-water activities that may be preliminary or incidental to that operation. 'Schedule' means a Schedule to this Notice. 'Search' means an operation, normally coordinated by a rescue coordination centre, using available personnel and facilities to locate persons in distress and overdue vessels. 'Speed restriction zone' means an area of water specified in a Schedule within which a master of a vessel must not cause or allow the vessel to be operated in excess of the speed designated in the Schedule. (e) trains, or provides finance for, people to take part in sporting competition. (c) waters within the limits of the State. 'Vessel' has the same meaning as in the Marine Act 1988. 'Victorian sporting organisation' means a sporting organisation recognised by the Victorian Minister for Sport and Recreation as the sporting organisation for a sport in Victoria. (c) is engaging in para-sailing or in a similar activity. (f) the removal, destruction or lopping of vegetation. (b) within an exclusive use or special purpose area prescribed in a Schedule to this Notice which is set aside for a specific activity under Clause 13 in which the width of water prevents the keeping of that distance. (b) within 50 metres of a fixed or floating structure in or on the water (including a wharf, jetty, slipway or boat launching ramp); except in an access lane. (c) when passing through a recognised anchorage for small craft. 5. An area of water specified in a Schedule as an access lane for the purposes of this clause is an access lane. (1) The master of a vessel which is towing a water skier at a speed exceeding 5 knots must ensure that the vessel is operated in a manner such that it departs from and returns to the shore only through an access lane. launching or retrieving the vessel at a boat launching ramp when the ramp is located within an access lane. (3) The master of a vessel must not cause or allow the vessel to be operated in an access lane unless the purpose for which he or she entered the access lane necessitates unrestricted speed departure from and approach to the shore. (iii) to a vessel which is about to enter or is already in the access lane for the purpose of gaining access to a boat launching ramp located in the access lane. (1) The master of a vessel must not cause or allow the vessel to be operated at a speed exceeding the speed specified in a Schedule for an area of water specified in the Schedule. (2) Despite sub-clause (1), a speed restriction specified in a Schedule for an area of water may be expressed so as not to apply on particular days or at particular times specified in the Schedule. (1) The master of a vessel towing a water-skier must not cause or allow the vessel to enter an area of water specified in a Schedule as an area where water skiers are prohibited. (2) A water-skier must not enter an area of water specified in a Schedule as an area where water skiers are prohibited. (1) The master of a vessel must not cause or allow the vessel to be operated in an area of water specified in a Schedule as being prohibited to vessels. (2) Despite sub-clause (1), a prohibition on vessels specified in a Schedule may be expressed so as not to apply on particular days, or at particular times, or to particular vessels, or to particular vessels travelling at designated speeds. (1) The master of a vessel which has an engine that is used for propulsion must not cause or allow the vessel to be operated in an area of water specified in a Schedule as being prohibited to vessels which have an engine that is used for propulsion. (2) Despite sub-clause (1), a prohibition on vessels with engines used for propulsion specified in a Schedule may be expressed to apply to vessels with engines of a particular type or capacity. 11. The master of a vessel must ensure that the vessel is operated in a manner which creates minimal wash or no wash in an area of water specified in a Schedule as a no wash zone. (1) A person must not engage in an activity in an area of water specified in a Schedule when such activity is prohibited in that area of water specified in that Schedule. (2) The master of a vessel must not cause or allow the vessel to be operated in an area of water specified in a Schedule when such operation is prohibited in that area of water specified in that Schedule. (1) Where an activity in an area of water specified in a Schedule is subject to a condition or conditions governing the use of that area of water as prescribed in that Schedule, a person must not engage in that activity in that area of water in contravention of the prescribed condition or conditions of use. (2) Where operation of a vessel in an area of water specified in a Schedule is subject to a condition or conditions governing the use of that area of water as prescribed in that Schedule, the master of a vessel must not cause or allow the vessel to be operated in that area of water in contravention of the prescribed condition or conditions of use. 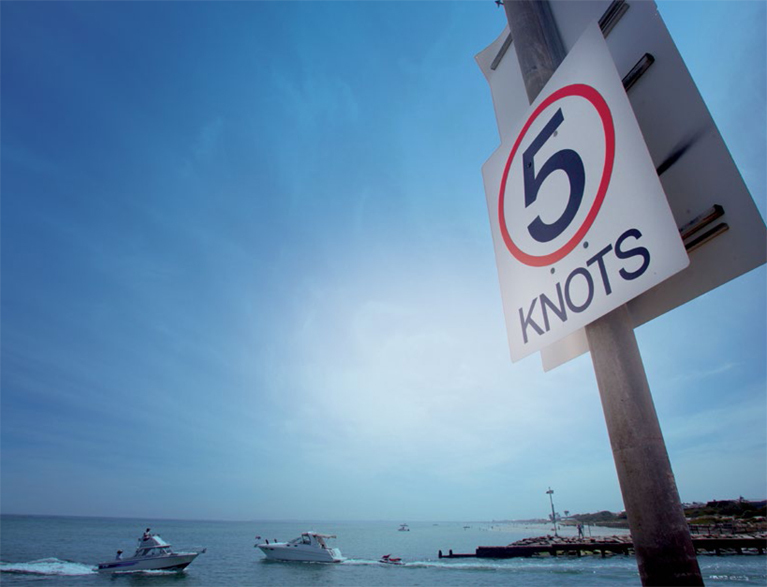 except when the vessel is operating in a speed restriction zone or an access lane or is being operated at a speed of less than five (5) knots. 15. When departing from the shore at any location the master of a vessel with an engine used for propulsion must ensure that the vessel is operated in a manner such that it gives way to all other vessels. 15A. The master of a vessel on any State waters must not cause or allow the vessel to impede the progress of a tug or other vessel assisting the movement, berthing or unberthing of a vessel. (b) within an access lane. 17. A person operating a sailboard, kiteboard or similar vessel on any State waters must not approach within 200 metres of any berth used for the purposes of commercial shipping. (c) when towing a person between one hour after sunset and one hour before sunrise. (b) which does not have attached to it a cut out or a device capable of producing an open exhaust. (b) in the case of a vessel of less than 10 metres in length, the minimum size of such dive flag or replica must be 750 millimetres by 600 millimetres. (1) Subject to sub-clause (2) any person engaged in diving in any State waters must use a buoy attached to himself or herself by a length of rope, such buoy having attached to it a dive flag or a rigid replica of that flag, the dimensions of such dive flag or replica being not less than 300 millimetres by 200 millimetres. (c) is engaged in diving solely for recreation and is not equipped with any breathing apparatus designed to facilitate diving. (1) The master of a vessel must not cause or allow the vessel to be secured to or in any other way made fast to any navigation marker, beacon, buoy, pole or post fixed in or on any State waters. (2) The master of a vessel must not cause or allow the vessel to be moored, berthed, or anchored in any area of water specified in a Schedule as being prohibited or regulated for that purpose. 23B. The master of a vessel must not cause or allow the vessel to be anchored in a channel that is marked with beacons or buoys. 23C. Where a channel or waterway has been obstructed by a vessel or its equipment, occupants or persons, the owner or master of that vessel and equipment must remove the obstruction from the channel or waterway without undue delay. (c) the master of a vessel engaged in works and authorised by a waterway manager, local port manager or port management body. Schedules for waterways detailed in this document are a reproduction of official notices published in the Victoria Government Gazette and cannot be used for legal purposes. Each Schedule as reproduced is referenced with the relevant Gazette number(s) in a table at the end of the Schedule. Waterway rules are designed to provide a safe operating environment, to cater for the wide range of boating and water activities, to separate different activities where needed on the basis of safety, and to reflect local conditions. The Schedules reproduced in this section are Notices made under either the Marine Safety Act 2010 (Vic) (MSA) or the preceding Marine Act 1988 (Vic) (MA). The table at the end of each Schedule also details the legislation that the waterway rule has been made under. The table provides an alphabetical list of Victorian waterways, the name of the associated waterway manager and the schedule number in the schedule document. The Lake Bolac Foreshore Committee of Management Inc.
Download the VOZR to read the Schedules. View information about the persons or bodies appointed to be waterway managers. Notice is hereby given under Regulation 231 of the Marine Regulations 1999 made under the provisions of the Marine Act 1988 of exemptions as described in this Notice from the carriage of safety equipment requirements specified in Regulation 230 and/or the Personal Flotation Device (PFD) wearing requirements specified in Regulation 232 of the Marine Regulations 1999. This notice revokes and replaces the Notice under regulation 603(4) of the Marine Vessels Regulations 1988 as published in the Government Gazette on 19 September 1990. 'PFD Type 1' means an approved Personal Flotation Device type 1 defined in Schedule 2 under Regulation 103 of the Marine Regulations 1999. 'PFD Type 2' means an approved Personal Flotation Device type 2 defined in Schedule 2 under Regulation 103 of the Marine Regulations 1999. 'PFD Type 3' means an approved Personal Flotation Device type 3 defined in Schedule 2 under Regulation 103 of the Marine Regulations 1999. 'Personal Watercraft' includes a power ski, aqua-scooter, jet bike, jet ski, wave runner, wave jammer, ski-free, motorised surfboard and any similar vessel that has an engine used for propulsion. 'Formal Training or Competition' means training or competition conducted under the direction of an incorporated club, organisation or association that is affiliated with the respective peak body where supervision of participants and appropriate rescue services are provided, or under a Safety Management Plan approved by Marine Safety Victoria. 'Lifesaving Appliance' means a lifebuoy or life raft or buoyant appliance in accordance with Section 10 of the Uniform Shipping Laws Code or a rescue tube in accordance with the standards specified by Surf Life Saving Australia. (i) persons operating a rowing boat or canoe or kayak engaged in Formal Training or Competition on inland waters, not being formal training or competition of which any part is conducted on water forming rapids, are exempt from the carriage of safety equipment requirements specified in Regulation 230.
b. PFD Type 1, 2 or 3 sufficient to support all persons that may be required to be rescued. (i) all operators and occupants of mechanically powered vessels (other than personal watercraft), operated by a club or training centre affiliated with Yachting Victoria Inc. and engaged in formal sail training activities for off the beach sailing yachts are exempt from the PFD wearing requirements specified in Regulation 232 providing that all occupants wear a PFD Type 1 or 2 at all times. (iii) all operators and occupants of vessels propelled by paddle or oar operated by Life Saving Victoria whilst engaged in Formal Training or Competition operating within visual range of a staffed lifesaving facility or flagged area are exempt from PFD wearing requirements specified in Regulation 232. (ii) all vessels fitted with a reinforced cockpit approved by the Australian Power Boat Association and engaged in competing in a power boat race on inland or enclosed waters when under the supervision of the Association and the race is conducted in accordance with the Racing and Safety Rules of that Association are exempt from the carriage of equipment requirements specified in Regulation 230 providing the operator of the vessel and any occupant being carried wears a PFD Type 1. This Notice was made by the Director of Marine Safety on 2 December 2005 under Regulation 231 of the Marine Regulations 1999. This notice of exemption applies to members of the Victoria Police personnel as defined under the Victoria Police Act 2013 (Vic) whilst attached permanently or temporarily to the Water Police and Search & Rescue Squads (“Water Police Squad members”), and whilst undertaking duties in Victoria Police vessels. in accordance with this notice. is granted for three years from commencement. This notice of exemption applies to the Masters of the MV Bellarine Express when operating on the waters of the Yarra River between beacons 23 and 24 and the southern dripline of the West Gate Bridge. Masters of the MV Bellarine Express are exempt from the requirements of: Clause 2.7.2 of Schedule 2 of the Vessel Operating and Zoning Rules for Victorian waters made under section 184 of the Marine Safety Act 2010 (Vic). All vessels less than 35 metres in length, on the waters of the Yarra River within the port waters of the Port of Melbourne, between the southern drip line of the West Gate Bridge and a line joining beacons 23 and 24 are subject to a speed limit of 8 knots. MV Bellarine Express may only exceed 8 knots when the visibility in the area of operation is equal to or greater than 200 metres. MV Bellarine Express will display an amber flashing light at all times while underway. The Master of the MV Bellarine Express will contact the Master of the Yarra Punt to verify the time they will be passing the area where the Yarra Punt operates when the visibility in the area of operation is equal to or less than 200 metres. A promulgated passage plan including operational times is to be made available to appropriate regulatory authorities and published on the Port Phillip Ferries website. Situational awareness tools including radar and electronic chart plotter with displayed AIS tracks are to be used. The Master of the MV Bellarine Express shall ensure that the installed AIS transceiver is active at all times while the ferry is underway. A lookout who is suitably trained and briefed, in addition to the Master of the ferry, is present on the bridge while the ferry is operating the area applicable to this exemption. Requirement to display amber light. 7. The Director Maritime Safety Victoria reserves the right to cancel or amend the exemption or conditions in his or her right, or on the advice of the Harbour Master, Victorian Ports Corporation Melbourne should hitherto unforeseen risks be identified or to impose additional conditions or vary current conditions. The exemption is subject to periodic review. This notice of exemption commences on 17/10/2018. This notice of exemption applies to participants and those involved in activities organised by Out Doors Inc.
Regulation 100(1), Regulation 100(2) and Regulation 100(3) of Division 4 – PFD Requirements, Part 6 – Operations of vessels (general) of the Marine Safety Regulations 2012, subject to the following conditions. Kokatak Maximus Centurion Rescue Life Jacket, US Coast Guard Type V.
The wearing of PFDs above only apply between the hours of sunrise to sunset. Emergency or urgent waterway rules - current emergency waterway closures, emergency directions and urgent safety rules. Permanent waterway rule changes - new or amended permanent waterway rules, proposed waterway rules and decisions made by the Safety Director about waterway rules. Temporary waterway activities - temporary waterway rule changes, exemptions or exclusion zones for on-water events, boating activity or works.